If you have questions not addressed in these FAQs, feel free to email us. Q1: Do the eggs have to be fresh? Q2: Can I freeze my fresh eggs until I have time to cure them? Q3: Do I wash the blood from the egg skeins? Q4: Should I cut my skeins into bait size pieces or should I cure them as full skeins? Q5: Do my eggs have to be at room temperature when I cure them? Q6: How much Quick Cure should I use? Q7: Can I mix the Quick Cure colors together? Q8: Can I add scents during the juicing process? Q9: Does Quick Cure stain surfaces? Q10: Is Quick Cure poisonous? Q11: No matter how hard I try, I can’t get a dry egg: what am I doing wrong? Q12: Once I have cured my eggs, do I need to freeze them? 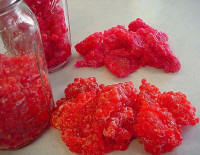 Q13: Is it better to store my cured eggs in plastic or glass? Q14: Where can I purchase cured eggs like the ones pictured on this website? A: Yes. We recommend that you cure your eggs as soon as possible. Eggs should be bagged and iced as soon as they are removed from the fish, and they should be cured within 24 hours. After 24 hours, the egg starts to break down and leak out of the membrane. 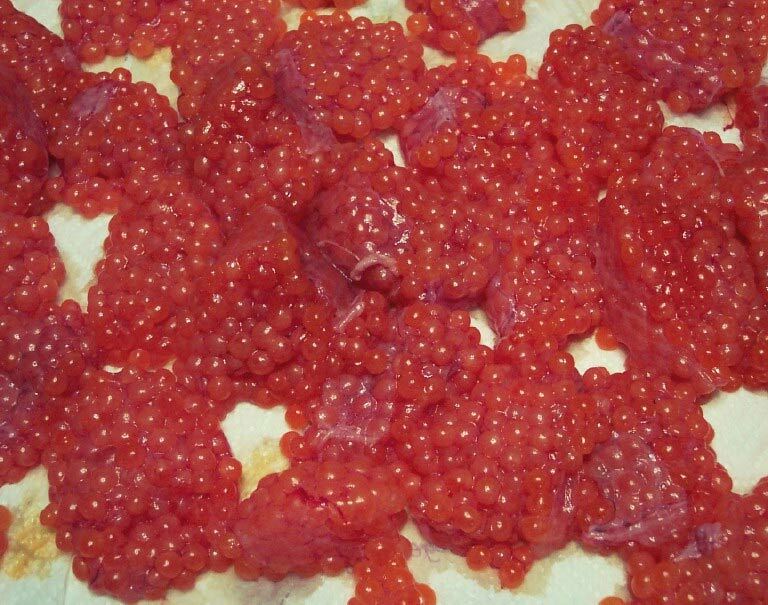 It is impossible to finish with spectacular bait if you start out with a leaky, spoiled egg. A: NO. 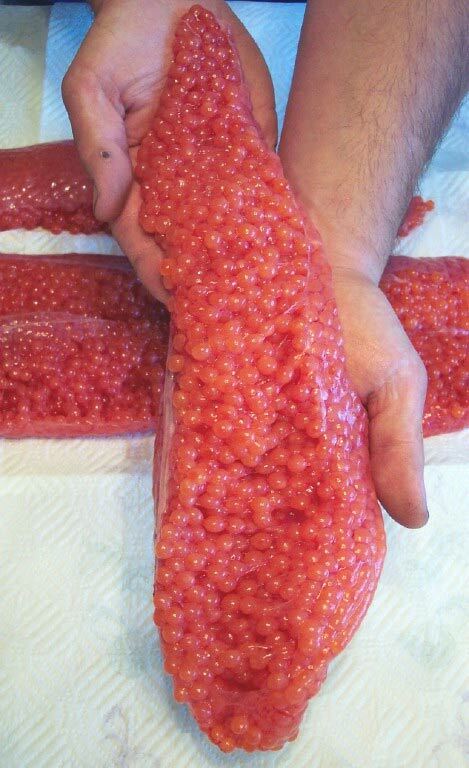 When eggs are frozen, the fluid inside of the egg freezes and the egg cells are ruptured. Once the egg is thawed, the fluid will leak out, and you will not have a quality egg to start the curing process. A: NO. We recommend that you wipe away as much of the blood as you can with paper towels. Water will weaken the scent and the milking ability. A: Quick Cure can be used either way; however, it is very important to make sure that you get cure in all the little spaces of the skeins. It is best to open the skein up if you decide to cure a full skein. A: YES, if you want a drier egg. Quick Cure absorbs better when used at room temperature. A: By trying different amounts, you will learn to custom cure your eggs. Use more Quick Cure if you like a dry bait, and less if you like your bait moist. The picture to the right is just a convenient amount to work with. Your project may take more or less depending on the "dryness" you wish to achieve. A: ABSOLUTELY. 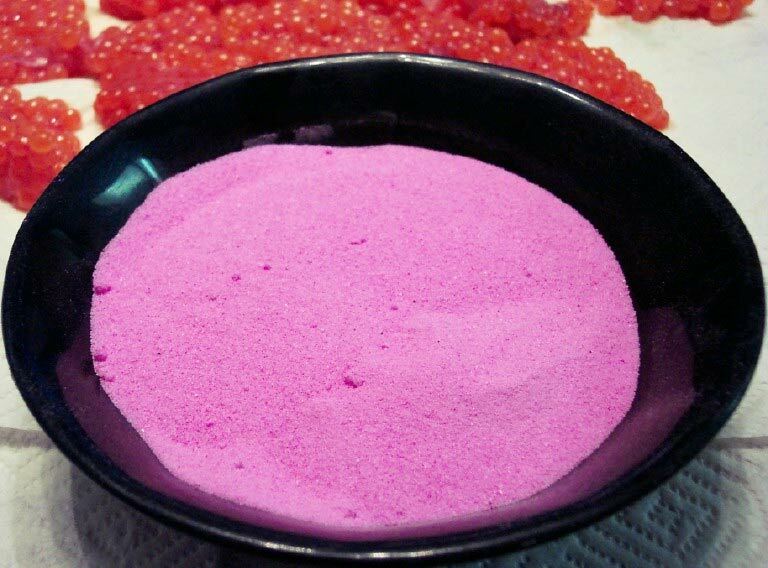 You can make your own custom bait color. 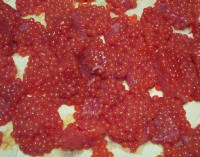 A: You can add scents if you would like, but Quick Cure eggs do not need anything added to them in order to catch fish. A: YES. Quick Cure will stain some surfaces and clothing. Usually, it washes off of skin with soap and water. A: NO. If it is ingested in a large quantity, then you should call the poison control center. If your pet should ingest Quick Cure, then he/she will probably experience digestive discomfort. A: NO. They will remain fresh for a couple of months in your refrigerator. For longer storage, we recommend storing your cured baits in vacuum-sealed glass jars. These jars can then be either refrigerated or stored in a cool dark place. Eggs pictured to the right are one year old. A: GLASS. The chemicals in Quick Cure can absorb the plastic odor.